age: umm couple hundred irken yaers. ._. height: in irken form she is about little taller than tak but in human forn she becomes as short as zim. Bek is one of the irken tallest's daughters. no one knows that tho. she always been with zim and hung out with him. zim was always annoyed by her cutesy and clingyness to zim. 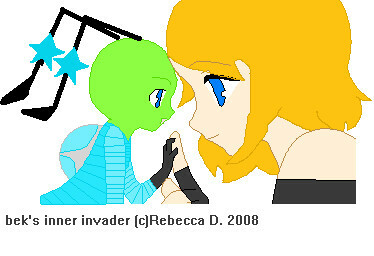 Bek wasn't suppost to be an invader but she convinced the tallest and she pass with flying colors. even tho she past they would not alow her to go to any planets. but when her sister ash was leaving to keep zim on earth she knew that she had to convince the tallest to let her go. when she got to earth she lived at zims house and tried to help him take over (even tho she isn't suppost to she does it to please zim. her human best friend is kat nep. even tho she is human she loves to hang out with her. Humor : Yes yes, so NORMAL am I. So Delicious I taste.